The $279 (as of 11/16/2012) Epson Expression Premium XP-800 Small-in-one Printer, hereinafter referred to as the XP-800 for all of our sakes, is a very competent, full-featured inkjet multifunction printer (MFP). It can copy, fax, scan, and print on specially coated optical media as well as paper. Print quality is exceptional. It will handle your small- and home-office chores with aplomb--and a bit of cash: Ink costs are on the high side. Physically, the XP-800 is smaller than the average MFP, at 15.4 inches wide by 13.3 inches deep by 7.5 inches tall when all doors and trays are closed. It's colored a sparkly midnight blue that looks different depending on the angle from which you view it. Said control panel, with its 3.5-inch touchscreen display, is well thought-out, though it would be nice to have all the contextually lit buttons on one side. As it stands, you must occasionally jump to the other side of the display. Generally speaking, however, the XP-800 is quite easy to use. Setting up the XP-800 is also easy. We used Wi-Fi, but there's ethernet and USB connectivity as well. The software is Epson's usual competent bundle, with scanning support. Epson also offers an array of apps for printing from iOS and Android devices, as well as via email. Alas, while there's a setup sheet, the user's guide is available online only, so you'll need an Internet connection to view it. Why Epson won't put a version on the installation CD (and hasn’t for years) remains a mystery. The XP-800 has great paper handling, but middling capacity. It automatically prints in duplex, and it scans two-sided as well using the 30-sheet automatic document feeder (ADF). However, the bottom-mounted main paper tray holds only 100 sheets, and that's a tight squeeze. A 30-sheet photo tray is integrated into the bottom tray, and a rear feed can be used for one-offs and legal-sized paper. A caddy stored underneath the unit is used to feed printable optical media, using a slot above the front 50-sheet output tray. Additionally, there's a USB/PictBridge port and, behind a small door, very well-marked card slots for Compact Flash, Memory Stick, and Secure Digital media. Along with its outstanding versatility, the quality of the XP-800's output is its greatest strength. Photos are top-notch, with a cool temperature but a classy, artistic feel. Text is sharp and black, and monochrome graphics are flawlessly gradated, un-tinted shades of gray. Even draft-mode documents are better than those from most printers. Scan quality is decent: a little fuzzy and a little dull-looking, but otherwise fine. 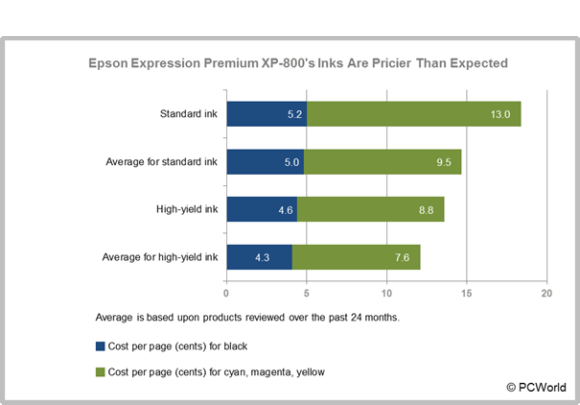 Ink costs for the XP-800 are a bit higher than we're used to seeing with an MFP this expensive. The standard $12.99 cartridges yield 250 pages for the black, and 300 pages for the cyan, magenta, yellow, and photo black. That makes text pages 5.2 cents apiece, and a four-color page approximately 17 cents. Those numbers drop somewhat with the $22.99/500-page black and $18.99 colors to 4.6 cents per page (cpp) and a little over 13 cpp for four color pages. Your mileage will vary with what you print, but running the XP-800 isn't cheap. The Epson Expression Premium XP-800's inks are pricier than expected. The XP-800 is fast enough for most purposes and quicker with photos than most. Text pages emerge at a rate of 10.3 pages per minute (ppm) on the PC and 9.7 ppm on the Mac. Snapshot-sized, 4-by-6-inch photos print at a speedy 4 ppm to plain paper and just over 2 ppm to glossy paper. Full-page photos printed on the Mac take about 80 seconds, or 0.7 ppm. Scan speeds are good as well, and single-sided copies exit at about 4.8 ppm. If you're not worried about operating costs--and you probably shouldn't be with a low-volume unit such as the XP-800--you'll like everything else about it. It's fast, it produces exceptionally nice output, and it lacks nothing in the way of features. The Canon Pixma MG8220 is most comparable in price and capabilities, with more paper capacity but no ADF. The HP Photosmart 7520 costs $100 less and lacks only CD\DVD printing. Epson's Expression Premium XP-800 Small-in-one Printer is a great little multifunction that handles every SOHO chore in the book and is especially well-suited for graphic artisans. But considering how much the printer costs, it feels like the ink should be cheaper.